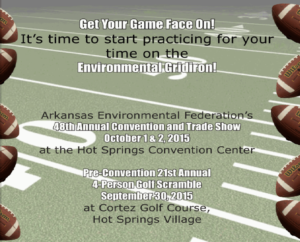 Hot Springs, AR: Join us at the Arkansas Environmental Federation Annual Convention October 1-2, 2015 in Hot Springs, AR at the Hot Springs Convention Center. We are pleased to once again be a title sponsor and exhibit throughout the event. Be sure to stop by our booth as well as register to win one of the great door prizes sponsored by Alliance Source Testing. To find out more and register online click on this link: http://environmentark.org/. We are looking forward to seeing our many friends in Hot Springs at the Arkansas Environmental Federation Convention! Want to learn more about stack testing and industry resources? Make sure you check out the AST Resources page. Already planning on going to the 2017 Convention? See event information below. IMPORTANT: Please be advised that hard copies of presentations will not be available. We will have Wi-Fi access and presentations will be available at www.environmentark.org during the conference. Please bring your laptop or tablet if you prefer individual viewing of presenter information. If you want to learn more about the 2017 Convention, check out the AEF events page.